ABOUT THE QUILT: I made this for my brother Jerry and his new wife Jennifer, who were married on July 31st, 1999. When I told them I'd make them a quilt as a wedding gift, they immediately requested a frog and turtle theme, as they have exotic frogs and turtles for pets (and two cats who also feature on the quilt as buttons). Frog and turtle fabrics come in either bright or naturalistic prints, so I decided to make a completely double-sided quilt to accommodate both. 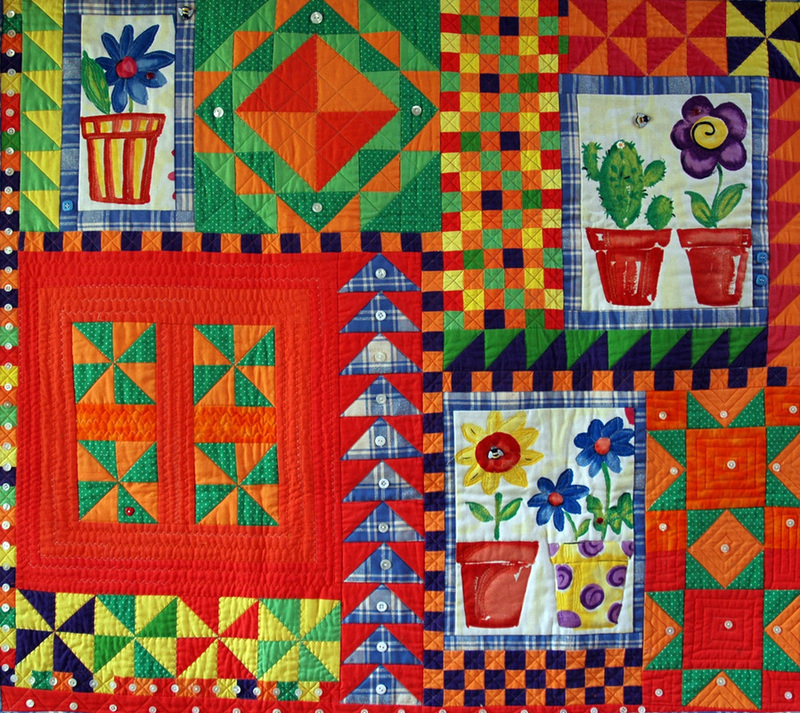 The patchwork frog and turtle patterns are Margaret Rolfe designs; a traditional block called "Toad in a Puddle" features on each side. Collection of Jerry and Jennifer Macho. ABOUT THE QUILT: This quilt was made for an American friend from my New York days who also married an Englishman named Robert (my husband's name) and is now living quite close to me in North London. These are the colors of her kitchen, and she asked me to make her a wall hanging that would be a bright focal point for the room. Because the design was kitchen based, I used a “Broken Dishes” block along the top edge. I also featured her own Designer's Guild fabric in three sections of the quilt. ABOUT THE QUILT: I designed this quilt entirely in my head while breast-feeding my newborn son—it kept me sane during those middle-of-the-night feeds! It took one week to piece using a full-size pattern of my own design, and then two months to quilt and embellish. Soft sculpture faces and pleats add a three-dimensional quality. The hand-marbeled fabric was purchased at Quilt Expo in Karlsruhe, Germany in 1994. It is embellished with beads to add some sparkle. “Foursome” went on a two-year trip around Norway, Sweden, France and England where it was part of the European Quilt Association's “Suitcase Exhibition”. The title derives from the fact that there are 4 quadrants with different things going on in each, 4 bright colors and 4 stars (with soft sculpture faces). ABOUT THE QUILT: I made this wall hanging as a wedding gift for my sister and her husband who are scuba divers. I had been collecting “fish fabrics” for years while waiting for the right background fabric to come along. I'm afraid that my sister did not find the piece very realistic, as both fresh-water and salt-water fish can be seen swimming together, which wouldn't happen in nature! It was quilted entirely by hand to create wave-like patterns in the “sea” with stipple quilting to imitate the effect of sand. Beads and coral were added for extra texture. Collection of Danae and Rick Maxwell.